A new online shopping site Jet.com is challenging Amazon and Walmart. I see its model as a mix between Amazon and Costco. Like Amazon, it’s all online. 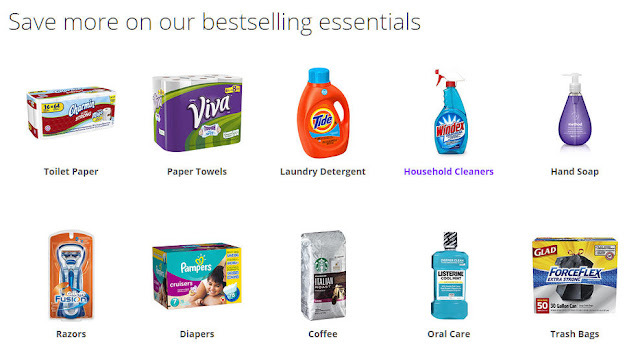 Like Costco, it focuses more on household products (see above image from its home page), but it doesn’t charge a membership fee. Jet also offers a volume discount: the per-unit price goes lower if you order more units in the same order. Shipping is free for orders $35 or over. It also includes free returns. If you waive free returns you will save another small amount. How do they make money by offering low prices? I don’t know, but if they lose money as a start-up, it’s really not my concern. The founders sold their previous company to Amazon for $550 million. They also raised $200 million from venture capital investors. If they figured out a good way to make money from low prices, more power to them. If not, they can afford to lose some money. This story on NPR also gives some interesting background: The Anti-Store. The problem with Jet and even amazon is they are not doing a good job at accounting for regional prices. The prices on Jet may be cheap in california, but in most places in the Midwest one can get the same products cheaper at the local walmart. After briefly searching a few random items (detergent, shaving cream, razors, clif bars), I don’t believe jet.com is offering me any better prices. I get that you can tweak the quantities, shipping, etc to possibly save marginal pennies here and there… The problem is that takes too much time. Maybe for others, it’s worth 10 minutes of their time to save another few dollars, but not for me. This USA Today article said they found Jet prices 30% less than Amazon on similar items. I don’t know what they loaded into their cart. This post should be updated. I got an e-mail the other day that there are no more membership fees. “We have some exciting news to share today. Membership at Jet is now free for everyone. Yes, that’s right. Free. You can continue using your current membership to shop Jet as much as you want, for as long as you want, without paying a fee for your Jet membership. We’ve been thrilled by the positive response to Jet since launch. Our customers are building bigger carts than we expected, taking full advantage of our dynamic pricing engine to shop smarter and unlock more savings. Now, without a membership fee, we are opening up the power of the Jet platform to even more people. And who doesn’t like a little surprise? As a thank you for being one of our earliest members, we’re replacing the 1 year free membership you started when you joined Jet with a 1 year Free Shipping Pass. This gives you free shipping, with no order minimum, through the remaining duration of the free membership you claimed. You’ll see your Free Shipping Pass (along with important details on its use) added to your account and available for use by next Thursday 10/15. Plus, stay tuned in the coming weeks for additional offers just for you. Updated. I haven’t received the email. I hope I also get the Free Shipping Pass. Also included a link to the NPR story at the end.